The 10th International Indian Film Academy Awards (informally known as the Decadial IIFA Awards) were a major film awards ceremony honoring the best Bollywood films of 2008. The ceremony was held in The Venetian Macao, Macau from 11 June to 13 June 2009. The choice of Macau as host city was considered a well-planned decision, aimed at reducing tensions between India and China, as well as to end the "deadlock" between the two countries over the issue of exchange of cinema. The ceremony was hosted by Boman Irani, Ritesh Deshmukh and Lara Dutta. IIFA completed 10 years of existence in 2009, giving awards to numerous prominent film personalities. In honour of this landmark, five special IIFA Awards were awarded that year, and these awards were collectively called as the IIFA Golden Decade Honors (also as the Artists of the Decade Awards). The film Jodhaa Akbar led the nominations tally with 16 nominations. It was followed by Ghajini with 10 nominations each, and Dostana with seven nominations. The major award winner was Jodhaa Akbar, winning 10 awards. Usually, the decision of a host city for the forthcoming IIFA Award ceremony takes place in the first press conference in the host city itself. 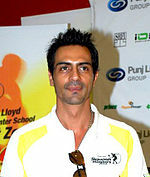 This rule was broken and the host city and venue for the 2009 edition of the awards was announced in Mumbai. Brand Ambassador of IIFA, Amitabh Bachchan, announced Macau as host city in an event in the JW Marriott Hotel. The venue was declared to be The Venetian Macao, one of the largest resorts in the world. Reportedly, Toronto and Istanbul had also bid for the awards. The next award ceremony were announced to be held in Colombo, Sri Lanka in 2010. Macau was once again hosted the 2013 IIFA Awards. Farhan Akhtar for "Socha hai" – Rock On!! Manu Rishi for Oye Lucky! Lucky Oye! Rakesh Roshan won Director of the Decade even though Sanjay Leela Bhansali had won the most IIFA Award for Best Director awards (Hum Dil De Chuke Sanam, Devdas (2002 Hindi film) and Black (2005 film)). If the year 2009 was counted, then Hrithik Roshan would have one more IIFA Award for Best Actor than Shahrukh Khan, for the films Kaho Naa... Pyaar Hai, Koi... Mil Gaya, Krrish and Jodhaa Akbar. Two: Oye Lucky! Lucky Oye! ^ "Venue of 10th IIFA Awards – The Venetian Macao, a casino". Archived from the original on 25 June 2009. Retrieved 19 June 2009. ^ "Choice of Macau – a diplomatic way to resolve escalating tensions in Indo-China?". Archived from the original on 25 June 2009. Retrieved 19 June 2009. ^ "Golden Decade Honours at IIFA 2009". Archived from the original on 17 June 2009. Retrieved 26 June 2009. ^ "Winners of IIFA Awards 2009". OneIndia. 15 June 2009. Retrieved 5 February 2012. ^ "2009 IIFA Award Nominations Announced". Desi Hits!. Archived from the original on 24 August 2010. Retrieved 5 February 2012.